I have a fantasy where I’m one of those hardass disciplinarian teachers, the kind whose students march in synchronized rows to the auditorium where I’m given some kind of award that these kinds of teachers always seem to get. While I’m standing at the podium of my real-life classroom daydreaming like this, one of my students turns in a piece of paper with a coffee stain on it after walking into class 40 minutes late, and while imperfect, the assignment shows clear development in language control and engagement. Suddenly, my “runs a tight ship” fantasy collides with my inner applied linguist, which naturally wants to reward development, even as my inner disciplinarian threatens to complain about me to my inner department head. Being a strict teacher sometimes works against the construct validity of grades. That is, enforcing one’s lateness, makeup, and assignment format policies drags the crosshairs of one’s grades away from “English ability” (however one defines that) and toward “not annoying the teacher by making them put out small fires all semester” or more charitably “being a responsible person in general”. This problem comes to vex me when I’m looking at a well-written paper turned in 30 minutes late without a cover sheet or a proper MLA header. Is the difference between A and C supposed to be the ability to follow abstract rules in principle? Where is that in the course outline, or to take a wider perspective, in any definition of linguistic competence? I honestly can’t imagine a class where this (taking points away for non-language-related violations) doesn’t happen at all – and I can imagine my colleagues’ frowns of consternation that I would even consider loosening late work policies in favor of some persnickety notion of validity we all last heard about in our MA programs – but I’ve noticed a trend in my work recently of lots of points hinging on things like “finding parking before class” or “understanding the difference between submitting in Google Classroom and submitting on Canvas” which I don’t remember being a prominent part of any theory of SLA. After all, I do have more eggs in the basket of “effective pedagogue” than “well-oiled adjunct faculty cog”. “Please read and follow the directions for this assignment” Actually, “being able to read an assignment” is clearly part of the competence that should be tested in an academic English class – but assignmentese tends to have its own idiom and in my view needs to be taught explicitly as its own topic. Ditto for lines like “work must be accomplished without external assistance beyond what is available to all students in the language lab” in the syllabus. “Please turn this assignment in on time” There is a clear relationship between accomplishing a specific language-related task within a time limit and linguistic competence. That said, I don’t think that extends to assignments that took all weekend and are being turned in 15 minutes late on Monday morning. “If you don’t understand the directions, email me instead of waiting for the due date to ask a question in person” There is an unhealthy tendency to run all competences in ESL through the bottleneck of writing on computers, but I don’t really see a way around this particular issue. After a sour experience with a student who abused the ability to contact me, I don’t give students any other ways to reach out. “Write your name” I do give points for people who forgot to write their names after I ask the class who this mysterious person named “Essay 2” is, but I definitely also give them a hard time about it. Some teachers don’t give points for work that is not gradable on time for any reason, and I certainly empathize. Not writing your name is essentially hijacking a few minutes of class time and precious mental resources of the teacher’s that could be going toward his seldom-read blog. “Have friends that you can ask for help for days that you were absent” Given that Canvas, while equally available to everyone and therefore “fair”, is nonetheless intimidating to the point of inaccessibility for some low-intermediate ESL students, a lot of assignments’ scores depend instead on having a friend who will collect homework sheets for you, explain them for you, and sometimes turn them in for you. If you don’t use Canvas and don’t have friends like this in class, your competence as reflected in grades will drop. Parts of this list make me react the same way my colleagues probably would: “You can’t seriously be talking about accepting…” or “Well, SOME teachers may not want their students to be responsible, but in MY classes…” and I understand this. I just want to point out that being responsible isn’t one of the areas of linguistic competence we all learned in grad school. 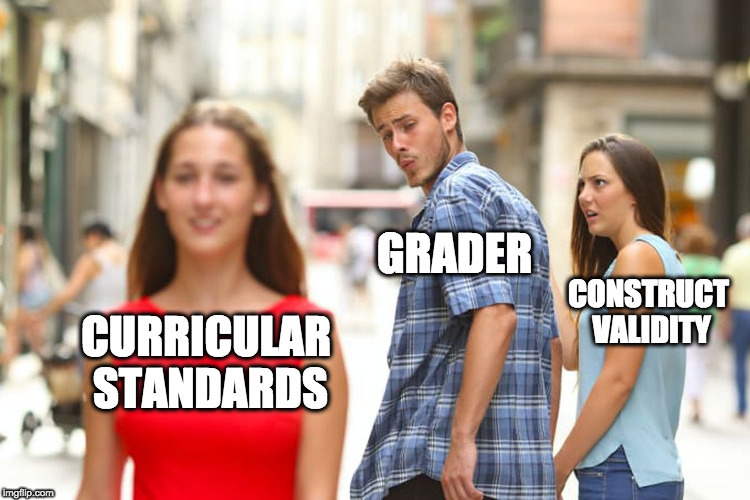 “This problem comes to vex me when I’m looking at a well-written paper turned in 30 minutes late without a cover sheet or a proper MLA header.” Most instructors that I know don’t let minor infractions with respect to form irretrievably damage a good grade for content. And you can also structure your course so that students get credit for their improvement over time. I’m not sure why you think that academic rigor involves turning students into automatons. At the places I taught, people didn’t get teaching awards for doing this. Developing humane course policies make life easier for both the instructor and the student. I can’t tell you what will work for your class, but you might want to check this out this thread on humane course policies (https://www.chronicle.com/forums/index.php/topic,82798.0.html) and see if there are any that could benefit your students. Or come up with your own. I sometimes exaggerate – format is never more than 5% of final grade for a paper, and not much of that is the header (but still, maybe it should be 0%). My grading policies in real life tend to fall far short of the spartan ideal I seem to be espousing here. For example, I do take late papers, but late drafts get a 0 since we use those in class on specific days. This post from the chronicle forum resonated with me: “Also, it is part of my Stockholm Syndrome teaching method–terrorize the students for the first couple of weeks, reward them the last weeks, and they will follow you to hell.” I know a teacher who does something very close to that, and she seems to get good results, perhaps the community college equivalent of elementary schools marching to assemblies. I think appearing to be less humane a grader than you actually are has something to say for it. My problem tends to be that I am humane and everyone knows it.